"May the odds ever be in your favor." It's a nice sentiment to say to any gamer. Lord knows we do enough with random elements. But it's also a saying from The Hunger Games (I'm pretty sure, anyway...) (I'm feeling a might peckish, m'self). 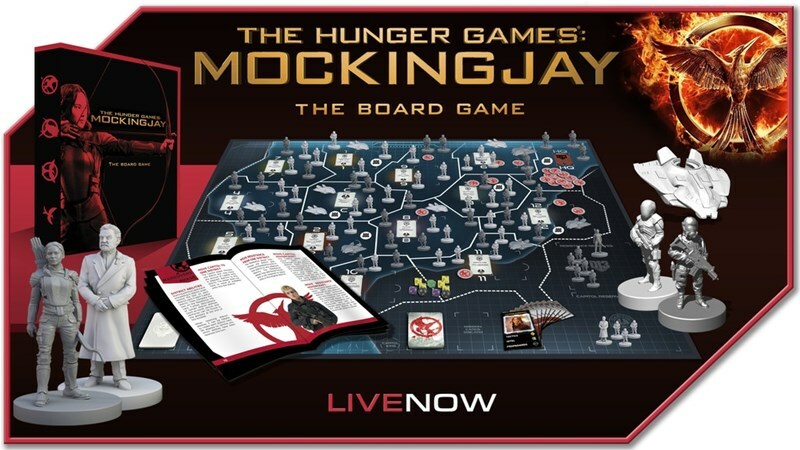 River Horse has launched their Kickstarter campaign to bring the movie (well, one of the movies, anyway) to your tabletop with The Hunger Games: Mockingjay The Board Game. Panem is in revolt. After Katniss escaped from the quarter quell to the mysterious District 13, she joined an all-out rebellion. The Hunger Games: Mockingjay - The Board Game is a strategic board game where two to four players must employ all their wits in order to free or control Panem. At first glance, the Capitol seems to have the upper hand with larger resources and the support of most of the districts. As the resistance spreads, the Capitol will find that their iron fist can only crush one assault at a time. This forces them to choose the most important targets and make tactical decisions in order to break through to the heart of the resistance, District 13, before the rebellion overwhelms the entirety of Panem. Each round, the districts that are not uprising give the Capitol power and the Capitol will move its forces to shore up the districts or prepare an offensive against District 13. The Resistance can spring up anywhere and must choose between spreading thin to sow rebellion or staying safe in larger numbers. Each player has control of Mission or Operation cards which are played into districts to bolster defenses, add rebellion or even move units out of an unfavorable situation. These actions are not guaranteed success however and your heroes must be placed wisely to give your side the upper hand. Will you focus on your own agenda or try to disrupt your foe? Combat in The Hunger Games: Mockingjay - The Board Game is quick, the resistance make their rolls and the remaining Capitol units fight back meaning that districts can have a mix of Capitol and Resistance forces by the end of a turn. Finally, the districts have rebellion tokens added to them or taken away depending on the forces and effects in play. The more rebellion tokens a district has the higher the chances of its uprising. If enough Districts join the Resistance they win the game! The campaign is up and running now and is set to go for another 20 days.